Be prepped to sweat, meditate, eat clean, have fun, be challenged, question everything, and make long lasting connections with yourself and peers immersed in nature. Yoga. Chant. Acro. Self Develop. 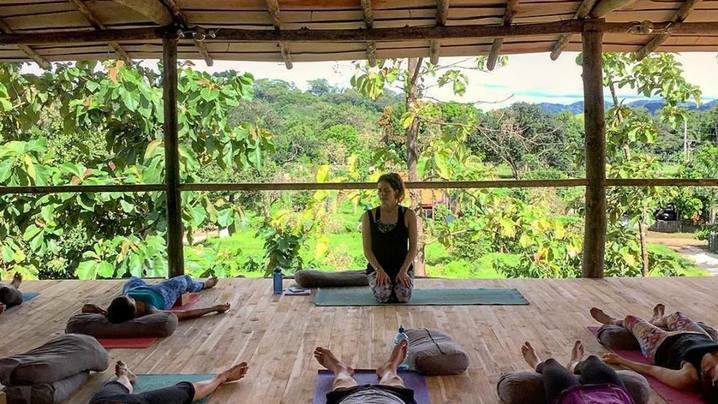 Enjoy daily yoga and meditation practices, including Sunrise Meditation and Yin Yoga, Mid-morning Vinyasa Flow/Ashtanga and afternoon workshops including a Nutrition Talk led by NYC based chef and Co-Founder of Love Grace Foods, Jake Mabanta, Acro-Yoga, Personal Growth, & an evening of live music! Bianca is a NYC based yoga teacher, community driver, and sound healer. What energizes and excites her the most is spending time outdoors on hikes and on the ocean beach, chanting spiritual song with friends and community, and traveling the world. She is moved to tears of joy each time she witnesses students taking risks and breaking through boundaries. Bianca is a single mom to a beautiful 4 year old girl she likes to call Angie or Lina (short for Angelina). In Bianca's classes, you can expect to dig deep, be playful, sing, dance, and explore outside your comfort zone where she believes growth happens. Join Bianca's Tribe and stay up to date on their trip!